In nature, composting worms provide a natural means of processing waste, producing both cast and tea. 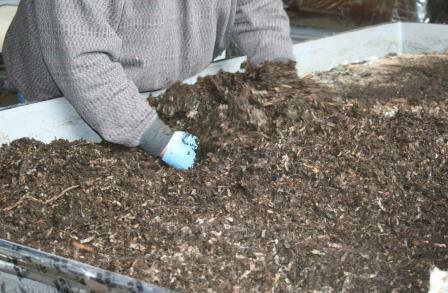 Worm composting, or vermicomposting, is doing the same yet in a controlled environment at home. The worms will compost your organic table scraps and yard waste, producing for your use, cast and tea. The rich, dark crumbly worm cast is an excellent, organic material that can be added to any of your planting situations - plants (indoor and out), vegetable or flower gardens, and any landscape or potted activity. The worm tea is liquefied cast and works well as a topical spray in those same situations. Composting with worms is a great way of taking your food scraps and organic waste and turning it into a nutrient rich, organic soil amendment. Worms use their biological process - they eat the waste and create an extremely useful humus like substance. It's most popular name is "worm cast" or "worm poop". Worms are nature's ultimate recyclers. Studies have shown that as food passes through the worm's body, the worms have the amazing ability to eliminate pathogens and carcinogens in the soil while adding various beneficial micro-organisms to the outcome. Those organisms, nutrients and minerals return to the soil which in turn sustains healthy plant life and vital plant growth; its nature's way of returning organic matter to the soil. Based on habitat, there are three classifications of earthworms: litter-dwellers, shallow soil or mineral soil-dwellers and deep soil-burrowers. All three classifications create cast that is rich with nutrients and micro-organisms during its passage through the worm's digestive system, but litter and shallow soil dwellers are your main type of composting worms. They live in the thin layer of decomposing plant material at soil level, and just below, eating plant residues found just below the layer of leaves and twigs. Red Wiggler Worms (Eisena fetida) are the top composting worm, the fastest. By nature, they are voracious eaters being able to eat up to their own weight in food each day preferring vegetation decay and compost. 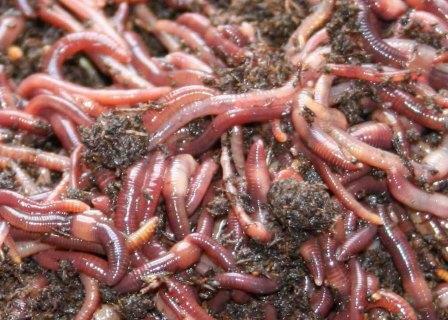 Red Worms are very compatible with European Night Crawlers for composting. 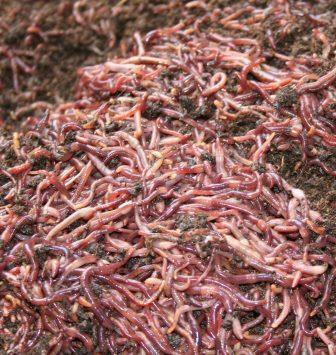 Red Worms typically compost where there is direct food whereas Euros continue to compost what Red Worms leave behind; they do the finishing work on larger pieces of compost. European Night Crawlers (Eisena hortensis), or Euros, eat up to half of their own weight in a day. They are more commonly found in soils that are rich in organic matter (woodland litter, garden soils) which makes them well suited for the older more finished mulches as well as doing well with leaf and grass molds. Euros are colony dwellers with the close quarters making them quick breeders. Although they are not as quick as Red Worms, Euros produce an average of a little over one cocoon a week, meaning that under perfect conditions the population will double about every three months. Red Worms produce an average of two or three cocoons a week, or triple population every three months. 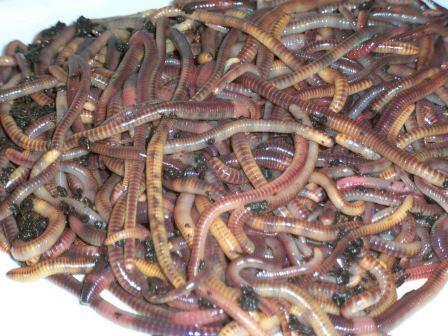 ¤ Worms can reduce yard composting time by 50%. ¤ Worm cast makes nutrients (like nitrogen, phosphorus and potassium) more readily available to plants due to their digestive process when compared to standard composting. ¤ Worm cast is rich in humus which improves soil aggregation. ¤ Cast is a form of organic fertilizer. ¤ Worm composting eliminates the need to "turn your compost". ¤ Cast improves the soil's physical composition. The microbial activity in worm cast is 20 times higher than in the material they compost, increasing the activity of existing micro-organisms in the soil. ¤ Worms are a natural soil detoxifier capable of breakinig down hazardous elements like lead, cadmium and other metals. Worm composting, whether as a compost pile or compost bin/container, uses organic material, food scraps and yard waste which means less garbage being sent to landfills, not to mention the resources used to remove and transport that waste. It's a step towards reducing your footprint for future generations and a very easy way to recycle and reuse your organic food waste and yard cuttings. Composting with Red Worms, an article put together by Whatcom's WSU Cooperative Extension, is an easy to understand paper that contains a lot of good information regarding worm composting, or vermicomposting, and general red worm information. For some more facts about worms check out our FAQ Page. We have specialized our worm feeding formula so, you, the customer benefit; our worms are the healthiest around with no short cuts taken! They are raised organically, developing into a nice, deep rich red color and are very active. Our worms are hand-harvested from the beds once a week. They are weighed without bedding and hand-packaged in a breathable cloth bag with how-to-care instructions so you'll know what to expect when they arrive at your doorstep. We carry both the Red Wiggler Worm (Eisena fetida) and the European Night Crawler (Eisena hortensis).